» Forum » Electro-Mechanical » EM Pinball Hangout » Wisconsin Dells machines? Huge long-shot I'm sure... spent my youth playing EM machines at various campground rec halls in Wisconsin Dells in the '70s-'80s. Anybody have a lead to tracking any of those down? Would love to buy what can be found. You need an old phone book to see what amusement operators were in the area at the time. Library or local historical society maybe? Wasn't there a Wisconsin Dells amusement park? Might be able to find someone who owned or managed that place and knows who provided the arcade equipment. I'm guessing most of them have long since been dispersed elsewhere. You never know though. Maybe there are some in storage somewhere in that area. Is there a specific title your looking for. Finding an example of a title you played will be a lot easier than trying to find the specific machine. 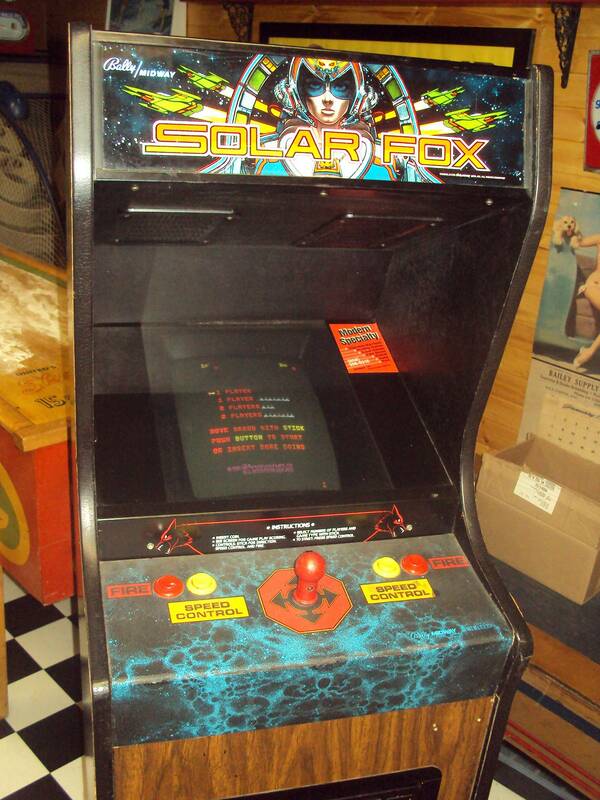 At one time I had a Solar Fox cabaret arcade game that had some paperwork from one of the Dells campgrounds in it. Most were probably owned by Norb & Chris of King Pin Games. Chris is on here under "KINGPINGAMES". Seriously though, if you do find something like that I'm nearby to assist. Here's a pic of the old Solar Fox I used to have. It had a Modern Specialty sticker on it which is out of Madison. I have no idea if they are still in business but the number looks to be 608-256-0216. I bought the game about 12 years ago and at the time it had some paperwork listing one of the campgrounds in it. If memory serves it was the Dell Boo campground which looks to actually be in Baraboo. The game may have been operated by different companies and in different locations. Hard to know if it was on site in 1981 when it came out, but it's a tiny piece of evidence you could pursue. I used to love those arcades in the upper Dells. Awesome memories of playing pinball with my Dad. A shout out to the old Gameland in Lake Geneva too. That place is where as a kid I learned to love big ball bowlers! I went with my Family in the 70s- some worldwide church of God thing I think. Hated that religion.. but I digress.. It was where I first played, and got a taste for what fun a Kiss machine was even though as a 4th grader, I thought Gene Simmons tongue was gross. I also played Exidy's Space Out, or whatever it was called. I had dreams, and drawings, and ideas spawned by playing that game that lasted for years.